Mayor Bill de Blasio, the Department of City Planning (DCP), The Municipal Art Society of New York (MAS), and Advocates for Privately Owned Public Space (APOPS) announced on Monday the kickoff to an international design competition seeking a new logo for more than 550 Privately Owned Public Spaces (POPS) across the city. POPS are indoor and outdoor spaces (e.g., street-level plazas, arcades, atriums) next to privately owned office or residential towers. The spaces are dedicated to public use and are owned and maintained by private property owners. 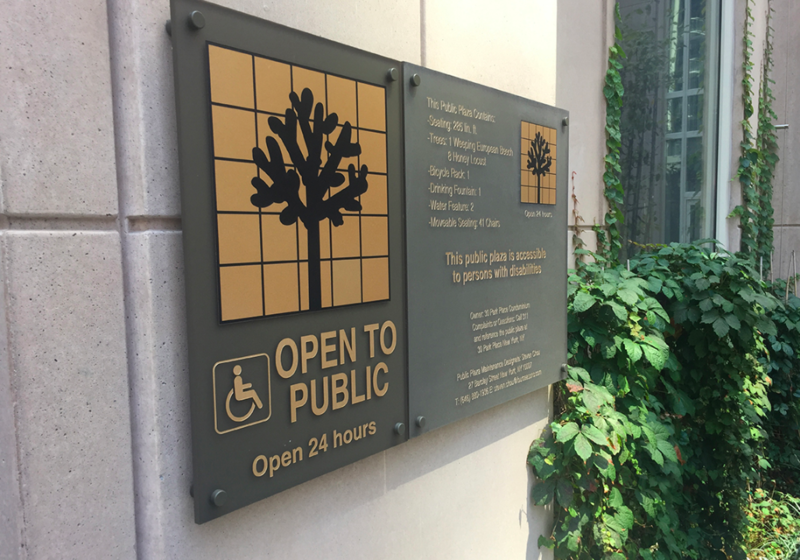 In 2017, the city passed a law requiring that all POPS display signage, informing visitors about the hours of access, required amenities (such as seating, water fountains, restrooms), info on who owns and manages the space, and how to report any complaints. The new logo will be included on POPS signage across the city, helping to create a consistent visual identity for the program. Entries will be accepted from around the world. The deadline to enter is Friday, March 15, 2019. No fee is required to submit an entry. Submissions will be posted online and displayed at a public exhibit in March, allowing the public to see all of the logo designs and vote for a favorite. 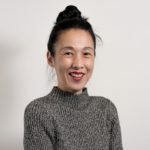 Along with the public vote, a panel of seven judges will select up to three finalists, each of whom will receive $2,000. DCP Chair Marisa Lago will pick the winning logo, awarding the designer with an additional $2,000 prize. The winning NYC POPS logo will be announced online on Monday, May 20. Established in 1961, the POPS program offers zoning incentives, such as floor area bonuses, to private developers of office and residential buildings in “the densest areas of the city” to encourage them to include public space in their projects. Combined, the city’s current 550 POPS offer nearly 3.8 million square feet of additional space to the public. Find out more about NYC’s POPS program at the Department of City Planning’s website. 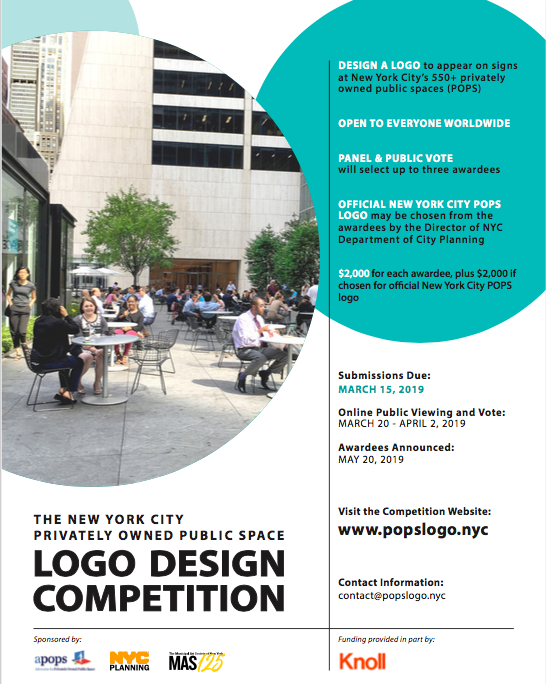 Learn more about NYC’s Privately Owned Public Space Logo Design Competition at popslogo.nyc.